1 of 1 Cut packaging from ice cream. Slice ice cream crosswise into 6 slices, and place on 2 small baking sheets. Freeze 1 hour. 1 of 4 Heat oven to 375 degrees F. Line two large baking sheets with nonstick foil. Mix flour, baking powder, baking soda and salt in bowl. Beat butter and sugar in second bowl until creamy. Beat in eggs and vanilla. On low speed, beat in cocoa. Beat in flour mixture and milk in 3 additions, beginning and ending with flour. 2 of 4 Drop 2 heaping tablespoons batter per cookie onto prepared sheets, spacing 3 inches apart. Spread into 2-1/2-inch rounds with the back of a spoon (keep size equal since they will be sandwiched). 3 of 4 Bake at 375 degrees F for 12 to 13 minutes or until cookies spring back when lightly touched in center. Cool on sheets 5 minutes. Remove cookies to rack to cool completely. 4 of 4 Remove one sheet of ice cream from freezer. Working quickly, cut circles of ice cream with 3-inch cookie cutter. Sandwich two cookies and one ice cream round. Save ice cream scraps for snacking. Repeat with all cookies and ice cream. 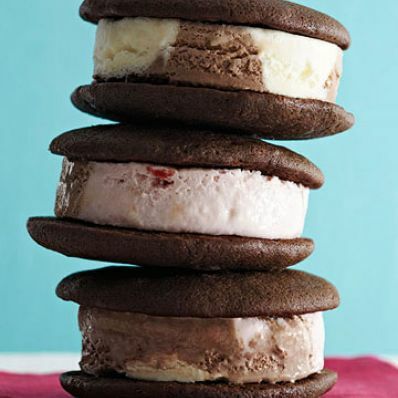 Wrap in plastic and freeze assembled whoopie pies at least 1 hour or until ready to eat. Per Serving: 7 g pro., 461 kcal cal., 25 g Fat, total, 55 g carb., 2 g fiber, 466 mg sodium, 15 g sat. fat, 106 mg chol.